Soooo…long time no see! As you’ve probably noticed, it’s been a little quiet ’round these parts this summer. It’s been a busy one so I decided to take a little break from the site to soak up as much sun and fun as possible. You see, we embarked on a vegetarian/vegan adventure, built a deck (DIY, of course! ), grew some ferns and strawberries (and lots of veggies too), went to Maine, worked a lot (no photo needed of the boring stuff), took a break from the aforementioned eating adventure to eat plenty of lobster and ice cream, found a killer alcoholic root beer, started swimming to balance out all the lobster, ice cream, and beer, and had a birthday (me). I’m back at it now, bringing you the epitome of summer desserts. And while this cake looks complicated, you need not worry. 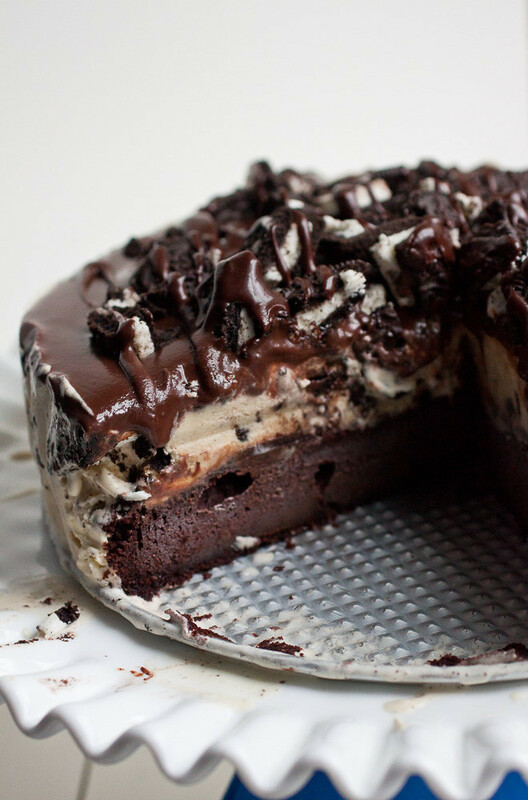 It’s a basic series of steps – 1 fudgy chocolate cake layer, topped with peanut butter Oreo ice cream (my favorite flavor from last summer), hot fudge sauce, and chopped Oreos – all of which can be completed separately over the course of a few days and then easily assembled. My birthdays as a kid were never without cake and a giant scoop of ice cream on the side so this cake is the best of both worlds. The result is satisfying, indulgent, and downright delicious – everything birthday cake should be! Make ahead instructions: Up to 2 weeks: Make the hot fudge sauce. 2-3 days: Make the chocolate cake layer, wrap tightly with plastic wrap, and chill. 1 day: Make the ice cream batter. Day of assembly: Chill the ice cream batter in your ice cream maker immediately before you assemble. To assemble: Butter the bottom and sides of a 9-inch springform pan. Place a 9-inch round of parchment paper on the bottom of the pan and a 4-inch tall long piece of parchment around the sides. The parchment along the sides of the pan should overlap slightly where the ends meet. Add the chilled cake layer to the pan. Using an offset spatula, spread the ice cream in an even layer over the cake layer all the way out to the edge of the pan. Cover with plastic wrap pressed tightly against the ice cream for at least 6 hours. Warm the hot fudge in the microwave just until it becomes spreadable, about 10-15 seconds. Remove the plastic wrap, and using an offset spatula, spread an even layer of 1 ¼ cups hot fudge sauce over the ice cream. Sprinkle the chopped Oreos over the hot fudge. 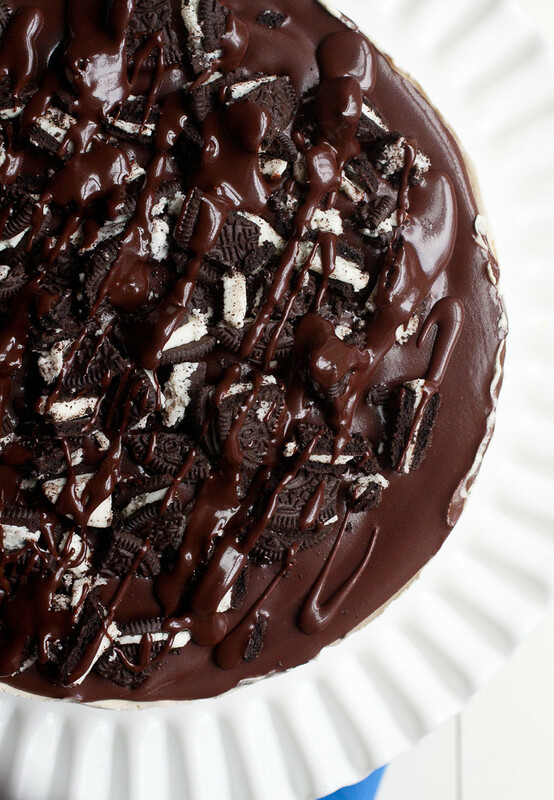 Drizzle the remaining sauce over the Oreos. Return the pan to the freezer to allow the hot fudge sauce to set up, at least 1 hour. When ready to serve, remove the sides of the springform pan and the parchment paper around the outside of the cake. Allow the cake to stand at room temperature for 10 minutes before slicing with a hot knife. Up to 2 weeks: Make the hot fudge sauce. 2-3 days: Make the chocolate cake layer, wrap tightly with plastic wrap, and chill. 1 day: Make the ice cream batter. Day of assembly: Chill the ice cream batter in your ice cream maker immediately before you assemble. Sweet goodness! 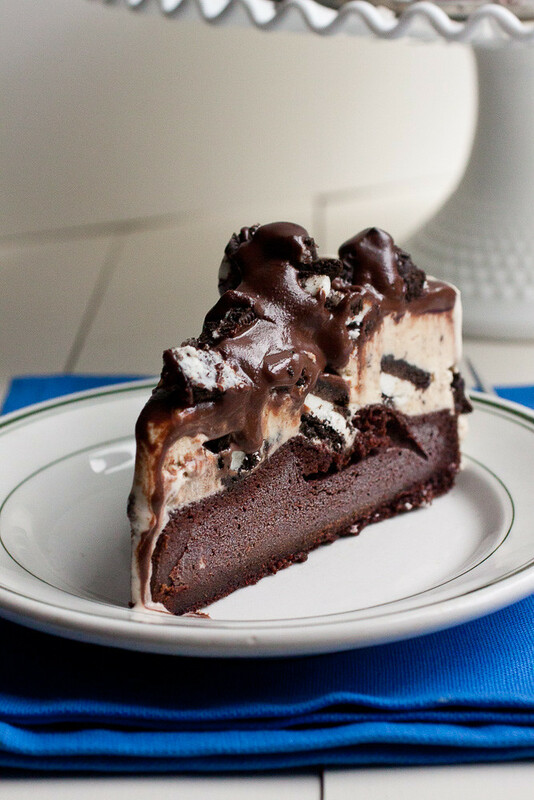 This cake is heavenly. So pretty and so packed with so many of my favorite flavours!! Thanks, Katrina! It’s pretty sinful! I’m trying not to eat dessert at the moment and now I see this! Oh man, I would blow my diet in an instant if this was in my kitchen!!! Oh yeah – this is a total diet buster. Thank goodness for birthday splurges though, right? This is dangerous food, sooo easy to make! Gorgeous! Thanks, Paula! Yes, so easy to make – even if you don’t make your own ice cream, you can soften store-bought ice cream and layer it in there. 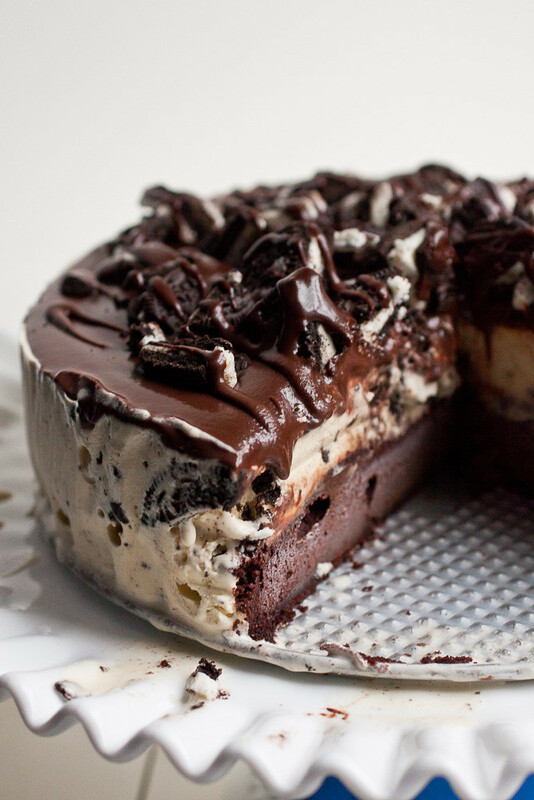 The perfect icecream cake for a chocoholic of which I know a few. Peanut butter and chocolate is my WEAKNESS!!! This cake looks completely amazing! OMG this is like the best birthday cake ever! obsessed with everything going on!